You will know exactly how goods or services can be conveyed from A to B in the best, cheapest, safest and fastest possible way. You can start your career, for example as a logistics analyst, planner, ICT consultant, purchase manager, supply chain manager or project manager. Like to know more? After your bachelor Logistics Engineering. In addition to acquiring specialist knowledge, during the programme you will develop all sorts of competencies which you will need later for being able to carry out your work well. You will do this by, amongst other things, working on a project basis on ‘real life assignments’ from the industry. Alongside projects, you will follow lectures, guest lectures and seminars, courses, training and coaching sessions. You will also undertake a number of work placements and participate in excursions and study trips. The entire study programme is very much practice-based. The total package is optimally linked to the demands of the profession and the possibility of continuing your studies further. In the first year you will learn what logistics means for various sorts of companies, what differences there are between companies and how you can survey all the logistics processes in a company or organisation. So you will become acquainted with subjects such as supply and purchasing management, law and transport management. For this purpose you will follow lectures, seminars, training sessions or guest lectures which are often linked to a group assignment. In the first year excursion week you will see how logistics is applied in all sorts of companies; you will see the theory from the preceding weeks in actual practice – an eye opener! Because logistics is an international specialisation, considerable attention is paid to logistics in an international context. At the start of the fourth year you will follow a minor: an in-depth minor in which you will further specialise in the subject area, or you will otherwise take a look just outside the limits of your subject area by following a minor to broaden your perspectives. In the second half of the fourth year you will carry out a graduation assignment for a company or organisation with complex logistical flows, for example. Once again you can opt for sectors where you undertook your work placement in the third year or otherwise a totally different area of logistics. If you buy something online in the evening, then you will also want it to be delivered the next day, so it does have to be in stock at the suppliers. For many products this is easy to organise, but how do you manage to have seasonal products in stock such as ice skates or swimming pools once the weather has turned? You will learn how you can make the right number of products or services available at the right moments. How do you ensure that for making a specific sort of car all the necessary components are available on time, produced in the right numbers and can be supplied to the client? Production logistics concerns planning and organising the production process. You coordinate the production process and monitor the planning and quality. Without transport everything would be at a standstill. Have you ever wondered about the way in which you ultimately come about your iPad or the jeans you are wearing? This can happen via all sorts of routes. More and more products are being produced in low-wage countries. This means that increasing more goods have to be transported over great distances. You will learn how a product or service can travel from the supplier to the client in the best manner. Which products are most frequently distributed from a warehouse? Are those products at the front or at the back of the warehouse on the highest shelf? To enable members of staff in a warehouse to move around as efficiently as possible it is important that the warehouse is setup to the optimum. In addition it is important to consider which processes can be automated or where indeed people are the important factors. In healthcare you are concerned with the organisation of logistic processes, such as the flows of goods (for example, equipment and medicines), information (important data has to be safely available at the right places) and people (for example, patients and visitors). This requires logistics specialists. The demand for professionals in this branch will increase rapidly due to the rise in the aging population. A concert or festival may often concern the main act of the day for the visitor. But have you ever thought about the organisation which such an event entails? Are there an adequate number of toilets for the number of visitors, what are the parking facilities like and have entering and exiting them been well-regulated? Event logistics concerns coordinating, monitoring and optimising logistics processes around events. Have you followed one of these MBO programmes at level 4? Then you would be eligible for the MBO-HBO fast track. On the basis of one of these MBO programmes you will be granted exemptions. In this way you can complete your study programme in three years. Three-year MBO-HBO track: how does it work? 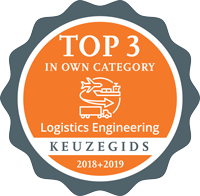 For a number of MBO programmes which correspond with Breda University of Applied Sciences, you can already become acquainted with Logistics Engineering in your last MBO year. For 16 weeks on a Wednesday you will take part in a number of training sessions and courses and carry out a project with us. If you receive a positive recommendation after the completion of this programme you can enrol in the second year of the study programme. Ask the student counsellor or study programme manager whether your MBO is participating in this enrolment programme. This programme always starts around mid-February and lasts till mid-June. If your school does not have an agreement with Breda University of Applied Sciences, then contact the student counsellor to discuss the possibilities. The enrolment programme is intended to discover whether the HBO is suitable for you and whether you can cope with education at this level. If you follow this programme you will be registered as a student at Breda University of Applied Sciences. You will not yet have to pay any tuition fees but you may make use of our student facilities. Come and take a look on an open day, you can experience the atmosphere of studying at an HBO institution and you will have the opportunity of talking to the student counsellor about the enrolment programme. How can you apply for this programme? To apply for the MBO-HBO enrolment programme, send an e-mail to aanmeldenslm@buas.nl. You will receive an application form for the three-year track and further important information about the application procedure. If you would like more information about the three-year track, contact the student counsellors from this study programme, Minke Snels and Lizanne Hessels: decaanslm@buas.nl, telephone (076) 533 26 44 or (076) 533 26 39. You can also download the prospectus Mbo-hbo doorstroomtraject (information is in Dutch).. Your first year will start in the regular second year which will be your propaedeutic year. After this you will follow the regular third and fourth years. Participating in this three-year track is hard work. For this purpose in the first year of the track you will be intensively supervised by a student counsellor. In these sessions you will consider how your studies are progressing, which subjects you are finding difficult, what your first results are and naturally whether you are enjoying it. If in December it appears that your results are disappointing then you will be able to transfer to the regular first year. You will then be able to complete your studies in four years. To apply, send an e-mail to aanmeldenslm@buas.nl. You will then receive an application form for the three-year track and further important information about the application procedure. If you would you like more information about the three-ear track then contact the student counsellors from this study programme via decaanslm@buas.nl, telephone (076) 533 26 44 or (076) 533 26 39. If you have a HBO or WO propaedeutic diploma, please contact the study programme for information about the three-year track. Contact the student counsellors for this study programme via decaanslm@buas.nl or via telephone (076) 533 26 44 or (076) 533 26 39. Studying for a while abroad will offer you the opportunity of broadening your horizons, both literally and figuratively. You will be in an international environment, meet people from different cultural backgrounds and moreover it is good for your language skills. In brief, studying abroad is a wonderful opportunity … go for it! In the fourth year of your studies you can spend part of the year studying abroad, for example in Hong Kong. Breda University of Applied Sciences has contacts with a number of universities which you can visit as an exchange student. As logistics student you will explore your specialisation during excursions at home and abroad. The cities of Hamburg, London and Barcelona are recurring excursion destinations.